The hybridoma technique for producing monoclonal antibodies developed by Drs. Kohler and Millstein in 1975 revolutionized the field of tumor immunology. It is now clear that there are antigens associated with or restricted to human neoplasms that have biologic significance. Monoclonal antibodies have already been demonstrated to have great immunodiagnostic value, and it is anticipated that they will become a component of our therapeutic armamentarium. Most investigators in the field, however, feel the true potential of monoclonal antibodies in cancer therapy remains to be determined. Clearly the most encouraging results have been witnessed in the treatment of hematologic malignancies. 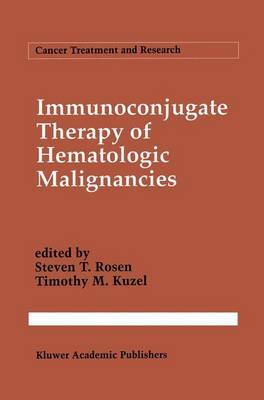 This volume of Cancer Treatment and Research explores the current state of the art of immunoconjugate therapy of hematologic malignancies. The first chapter, authored by Drs. Rosen and Kuzel, reviews the current status of radioimmunotherapy of lymphoma. Results of clinical investigations utilizing radiolabeled immunoconjugates in B-cell lymphomas, T-cell lym- phomas, and Hodgkin's disease are discussed. In addition, obstacles to effective antibody therapy are highlighted and toxicities are summarized. Chapter 2, written by Drs. Sgouros and Scheinberg, critiques the treat- ment of leukemia with radiolabeled monoclonal antibodies. In this chapter, the unique features of leukemia that make it particularly suitable for radio- immunotherapy are discussed, an overview of selected clinical trials is presented, and a treatment planning approach to radioimmunotherapy in- corporating biologic and physical parameters is reviewed.